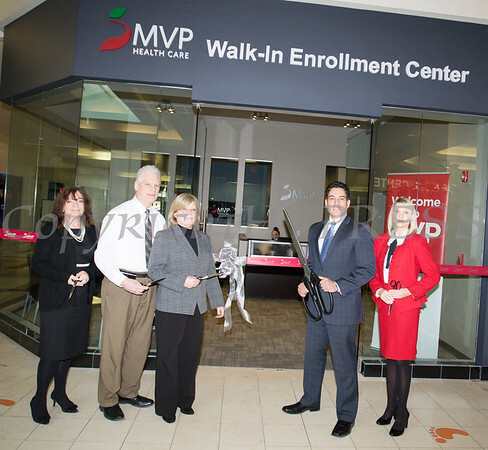 MVP Health Care expanded its walk-in enrollment center at the Newburgh Mall on Wednesday, January 10, 2018. OC Chamber of Commerce President Lynn Allen Cione, Newburgh Mall General Manager Terry Parisian, MVP Eecutive Vice President Medicaid and MVP Operations Cathy Clancy, MVP Vice President Retail Outreach Mark Santiago and MVP Director Retail Outreach Field Operations Kate Waage cut the ribon for the MVP Health Care expanded walk-in enrollment center at the Newburgh Mall on Wednesday, January 10, 2018. Hudson Valley Press/CHUCK STEWART, JR.